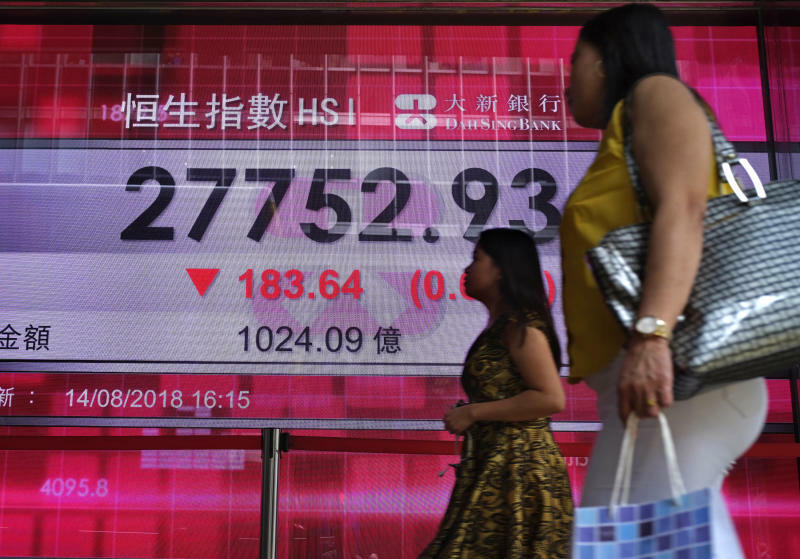 BANGKOK (AP) -- Stock markets turned lower Wednesday amid concerns about economic growth and continued tensions over Turkey, which announced it was increasing tariffs on imports of some U.S. products. KEEPING SCORE: Germany's DAX fell 1.1 percent to 12,220 and in France, the CAC 40 dropped 1.2 percent to 5,339. Britain's FTSE 100 was down 1.1 percent at 7,525. The futures contracts for the S&P 500 index and the Dow Jones industrial average were both down 0.6 percent. COMMODITIES: Shares in mining companies were down as the price of commodities fell, with investors appearing to lower their expectations for global economic growth. Shares in Glencore were down almost 4 percent while Rio Tinto was off 3 percent. Oil companies were also under pressure as the benchmark U.S. crude fell 60 cents to $66.44 in electronic trading on the New York Mercantile Exchange. Brent crude, used to price international oils gave up 49 cents to $71.97 per barrel. TURKEY TURMOIL: Turkey's currency stabilized, rising 4 percent, after authorities sought to ease liquidity problems in the banking system. But tensions continued with the U.S., which had aggravated the crisis, with Turkey imposing new tariffs on U.S. goods. And there is no sign that the president will let the central bank raise interest rates, which economists say it should do urgently to support the currency. CURRENCIES: The dollar fell to 111.01 yen from 111.14 yen. The euro slipped to $1.1323 from $1.1348.